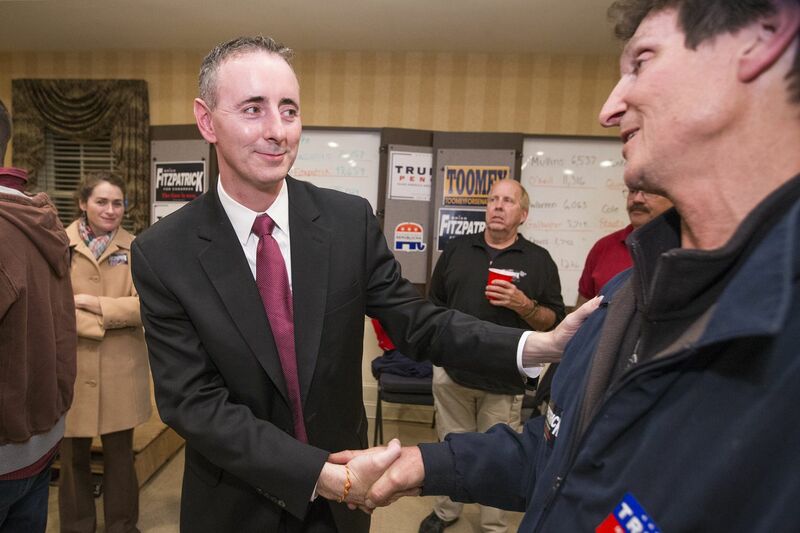 Brian Fitzpatrick (left) is congratulated at Republican headquarters in Doylestown on Election Night in 2016. U.S. Rep. Brian Fitzpatrick landed a blockbuster endorsement this week, the kind that could help the Republican keep his head above water in his suburban swing district if there's a blue wave. Everytown for Gun Safety, a gun-control group founded by former New York City Mayor Michael Bloomberg, said it's supporting Fitzpatrick's reelection campaign in Bucks County. Former Democratic Congresswoman Gabby Giffords' political action committee is also backing him. It reminds Clout of the 2016 Senate campaign, when Giffords' group threw its weight behind Republican incumbent Pat Toomey after he cosponsored a bill to expand background checks. Toomey used Giffords' support to solidify his brand as a moderate — an image Fitzpatrick also cultivates — in the Philly suburbs. Toomey won by 1.4 percentage points. The internal politics of Everytown for Gun Safety's endorsement are just as intriguing. The Bucks County iteration of Everytown's grassroots arm, Moms Demand Action for Gun Sense in America, disbanded this week to protest the endorsement, said former coleader Jessica Getz. Getz said Fitzpatrick didn't show up at the local March for Our Lives or other gun-control events, while his Democratic opponent, Scott Wallace, did attend. She also disliked that Fitzpatrick said in a letter that he voted against the Concealed Carry Reciprocity Act, an NRA-backed bill that would make states honor concealed-carry permits from other states, because of "extraneous provisions" in the legislation. He has a "firm belief in the concept of reciprocity," he wrote. "The fact that he would have supported that is outrageous," said Getz. Fitzpatrick said he is "puzzled" by Getz's criticism: "I'm the only Republican in the entire state, and probably beyond that, that hasn't accepted a dime from the NRA." He supports universal background checks, he added, and believes that concealed-carry reciprocity legislation could "actually enhance public safety" if it required gun owners to meet the standards of the strictest states in the country. Molly Corbett, a spokesperson for Everytown, said Fitzpatrick earned the endorsement by voting against the reciprocity bill and cosponsoring legislation allowing police or family members to ask state courts to temporarily remove guns from dangerous people. Getz said Giffords' endorsement of Toomey — and what happened afterward — is top of mind. "He voted yes for concealed carry," she said. "He voted in two NRA-approved Supreme Court justices." What's the best thing about Republican gubernatorial nominee Scott Wagner? According to President Trump, who campaigned in Erie this week, it's that Fox News host Jeanine Pirro — a.k.a. Judge Jeanine — "thinks he is fantastic." That might be true, but it appears Pirro wanted $24,500 to say it. That's how much the Wagner campaign paid her to speak at a fund-raiser Wednesday at York County's Wyndham Garden Hotel, records show. It isn't clear if that covered travel expenses. According to Pirro's speaker bureau bio, she requires first-class airfare and expenses out of New York. Celebrities like Pirro often charge a fee to speak at events. But $24,500 is a decent chunk of change for Wagner, who wrote in a fund-raising email last weekend that he is "tapped out" after investing more than $10 million of his own money in the race. Perhaps Pirro gave him a boost: The Wagner campaign charged $130 for general admission. For $50,000, you could get 20 tickets to a VIP reception, a photo op, and 20 "specially autographed" copies of Pirro's New York Times best-selling book, Liars, Leakers, and Liberals. At Andy Warhol’s gravesite in a cemetery outside Pittsburgh, visitors leave all kinds of mementos. Notes. Paintings. Balloons. And, of course, the obligatory Campbell’s Soup cans. But state House candidate Sharon Guidi may have forged a new and not-so-tasteful path this past weekend when she showed up at the cemetery and planted a lawn sign next to Warhol's tombstone. Unbeknownst to Guidi, one of the live-feed webcams set up by EarthCam across the globe captured her in the middle of the deed. Still photos of her have been beamed all over her district ever since. Guidi, a Democrat running in suburban Pittsburgh, said she meant no harm. "When my volunteer and I visited Andy Warhol's grave, we never intended to politicize our visit in any way whatsoever," she said. "We are both huge fans of Warhol's art and had no plans to share this moment with anyone but ourselves. I sincerely apologize if I offended anyone." Madelyn Roehrig, a onetime Pittsburgh-area resident writing a book about her near-daily visits to Warhol's final resting place, said the artist may have been amused by Guidi's graveside campaigning: "You know how Andy was always on the cutting edge of things." The midterms may not be over yet, but the 2019 mayoral race is already heating up. Former City Controller Alan Butkovitz seems as if he's thisclose to announcing that he's challenging Mayor Kenney in next year's Democratic primary. He says food merchants and beverage-bottling mogul Harold Honickman, a leading critic of Kenney's soda tax, have made financial commitments to him. He's also throwing a fund-raiser next month. But he wouldn't divulge how much he's raked in so far. That's why campaign finance reports exist, he said: "Let them be surprised."